If anyone knows the art of power dressing, it’s Beyoncé and Jay Z. The music industry powerhouse stepped out to support longtime pal Usher at the Hands of Stone premiere Monday night in New York City, and the pair slayed like usual. 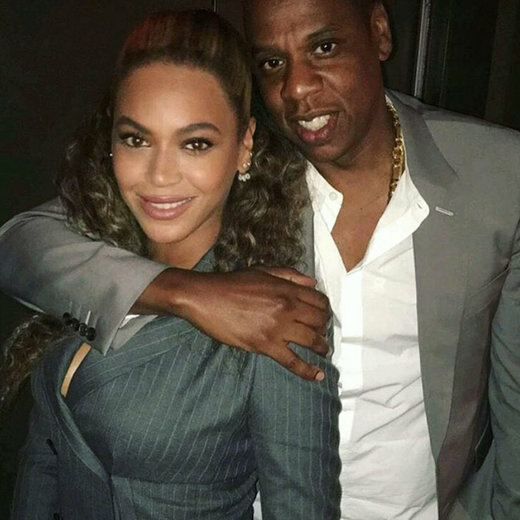 Queen Bey made a bold statement in pinstripes, choosing a stone-colored fitted double-breasted suit jacket with a plunging neckline and a matching miniskirt for the date night. The 34-year-old songstress finished off her look with gray ankle strap heels and sunglasses, and pulled her curls back into a half-up style. The power couple stars in a cute photo on Usher’s Snapchat from inside the event, where the 46-year-old rapper grins as he wraps his arm around his wife. The “Empire State of Mind” hitmaker followed Beyoncé’s lead in a light gray suit for the event, which he paired with a gold chain, a white collar-less button-up shirt, and white kicks.